January 31st-Knockouts and Lady Love what more could we want! It's fair to say that January has been a slow month for boxing. Sure we've had some fights but the notable ones have been few and far between. Thankfully the month is now coming to and end and we are on the verge of some massive fights around the world. Although we still need to wait for them, the wait isn't long. The only televised action with an Asian interest is in Thailand where Channel 7 do their usual Friday show. As is usually the case, sadly, we're unsure on the full details of the show. What we do know is that amazingly well named Knockout CP Freshmart (4-0, 3) is listed as fighting on the show. Knockout, the current WBC Youth Minimumweight champion, may sport the best name in world boxing right now but he also seems to be very talented and we'd be expecting him to retain his title here. As well a the Knockout fight we're expecting at least 2 other bouts to fill the 2 hour slot from Channel 7. As well as the televised card in Thailand there is also an untelevised show in the Philippines. This show, promoted by Shock Punch Promotions, is another one of those Filipino shows which doesn't really have anything that stands out but yet keeps the countries boxing alive between the bigger shows. As with the Thai show there is an amazingly named fight on this card courtesy of female fighter Lady Love Sampiton (0-2), pictured. The win-less female will be taking on the "stop or be stopped" Cheraly Dagit (3-2, 3) who probably will have too much for Sampiton though hopefully we'll get to see Sampiton fighting on even if she does fall to 0-3 as expected. Although the Filipino card is one with out much in terms of quality we are interested in the 6 round contest between Antonio Melencion (2-4-1) and unbeaten Japanese fighter Kyota Otsuka (2-0, 1). Aged 19 Otsuka is one of the very few Japanese fighters plying their trade away from home and although he's unlikely to be a star his story is an interesting one to us. The main event, if you can call it that, of this show is a contest between the limited JC Francisco (5-6-2, 1) and the even more limited Ricky Oyan (4-18-2, 2). This bout, the only 10 rounder on the card, is certainly not a bout we are looking forward to though with both men having losing records it may turn out to be moderately entertaining. It's not often where we get cards and can't recognise anyone from it, though this Thursday sees one such case as Japan hosts a 13 fight card where none of the fighters ring any bells. Unfortunately all 13 bouts are at the 4 round level so in all honesty it would have been a shock had we known much about them, though what cards like this do is keep the action going thick and fast with next to no slow down. The show, dubbed "Freshboy Vol 82", is to be held at the Korakuen Hall and with the lack of big names comes a lack of a hefty price with the most expensive tickets costing just 10,000yen (less than $100 for our American readers). The show is expected to begin with a fight in the Welterweight division, we believe this will see Fumio Takehara (0-3) fighting against Sasaki Torataro (?-?). We'll admit however that we're not sure on the actual fighters, merely that the bout is a 4 rounder in the Welterweight division. Following the opening contest we expect to see bouts across a variety of weights from Minimumweight to Middleweight. Going through the fighters in those bouts the one of the few names we do recognise is Middleweight Naoya Kaneko (2-1, 2) who will be fighting Tatsuya Aizu (2-3, 2) in what should be an explosive encounter. This bout will be the 10th contest on the show. The final bout on the card is at Super Featherweight where Takahiro Araki (3-2, 2) will be fighting against Yu Takegaki (3-1-1, 1). Araki may be recognisable form last years rookie of the year though unfortunately Takegaki isn't a man who rings any bells as he hasn't been in a fight since 2012. Whilst the card has no sort of "name" on it it does look like a cracking card in terms of value for money and should be something very fun if you can get tickets to it. With a scheduled 52 rounds it may not last long but should be full of action through out. This Wednesday might not be a big days for world boxing but that doesn't mean that we are fightless, in fact we, as Asian boxing fans manage to get ourselves a few small bouts on a show headlined by former world champion Anthony Mundine. 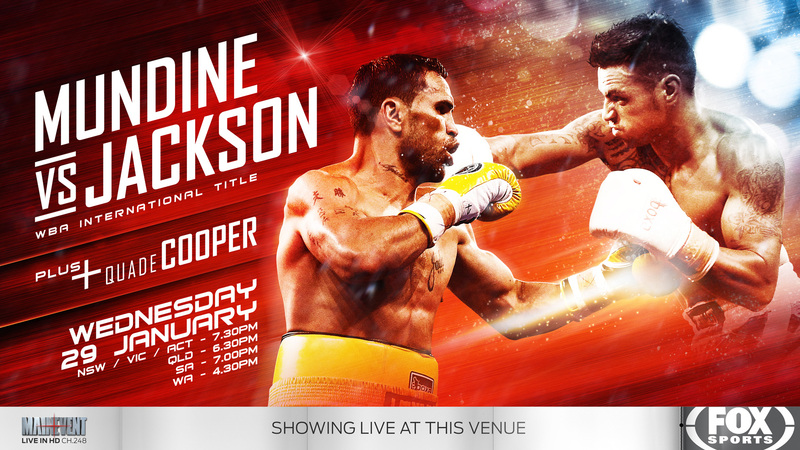 Whilst the main event, as shown on the poster, is Anthony Mundine v Gunnar Jackson we are looking forward to two of the under-card bouts. The most promising of those two bouts sees Thailand's Jaikom Paitoon (1-0) taking on fellow unbeaten George Kambosos Jr (3-0, 2). Jaikom debuted as a pro boxer late last year though was apparently a very good kick boxer. He is, admittedly, the under-dog here though we'd not be massively shocked if Paitoon did manage to score the upset. In the other bout the debuting Pramool Boonpok (0-0), also of Thailand, takes on the very highly regarded Cameron Hammond (6-0, 3). Hammond, who competed at the 2012 Olympics, will be expected to take an easy victory over Pramool though the Thai was a very good kick boxer. Although Asian boxing has been relatively quiet over the past few weeks we're happy to announce that things look like they are set to kick off and get back in the flow that we were so used to last year. Although we don't have a big card here, we do have one which does look like the sort of staple of the Japanese scene. 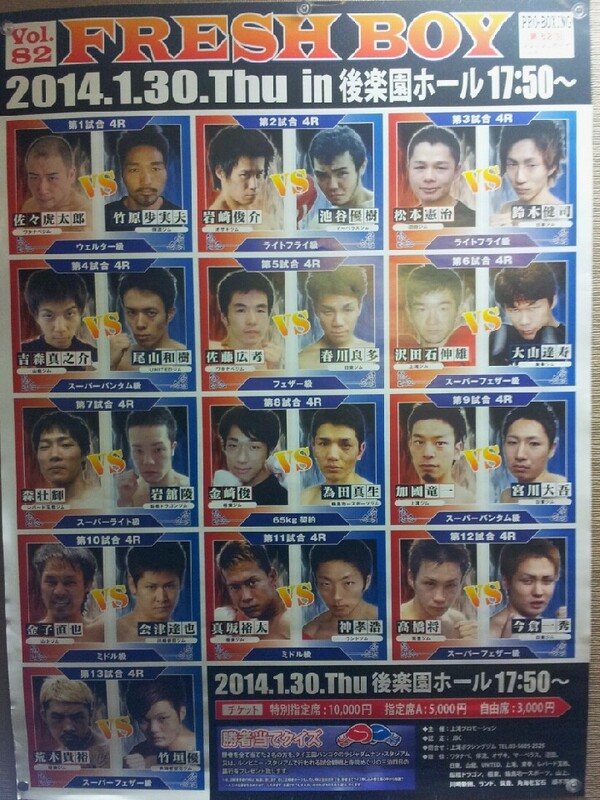 The card, put on by Yonekura Gym, is a show which features 8 scheduled bouts as well as an exhibition contest featuring a Japanese legend. It's this legend that we'll start with as he's the man who takes up the centre piece of of the poster. The man pictured is Yoshinori Nishizawa (31-21-6, 19), who at 48 years old is finally hanging up the gloves and having a retirement bout. 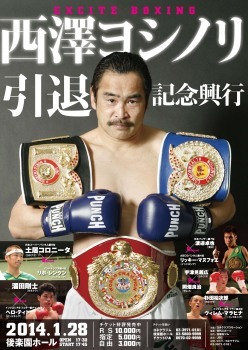 A 2-time world title challenger Nishizawa has had an extraordinary career. He has fought in Japan, Australia and Germany and lost in notable world title challenges to Anthony Mundine and Markus Beyer. Thankfully rather than continue on he has made the right decision to call time on his long career. Although Nishizawa is the star of the show his bout isn't a competitive one and will be little more than a celebration of his career. What we do have though is 8 competitive bouts. The pick of the bunch in regards to competitive action sees the hard hitting Tsuyoshi Tameda (8-1-1, 7) taking on Indonesia's Hero Tito (7-3, 3). The bout looks like one we need to favour Tameda in though he hasn't really been in bouts that have tested him in a way that we'd have hoped for someone with such an impressive looking record. Notably Tito gave IK Yang a very hard fought contest last time out, dropping a 6 round decision to Yang and could well be a banana skin here. In an equally well matched contest, at least on paper, Coronita Doi (27-14-8, 10) takes on Indonesia's Rivo Rengkung (32-17-5, 12). Neither of these two guys are ever going to compete for a world title but both should be able to put on a good fight here and it's one that should be better than the record of the men would suggest. With 6 other contests on the show we are expecting something pretty from this show, even if it's not a show full of big names, it should more than interesting. This week is an incredibly busy one in Thailand with no less than 3 televised shows. The first of these comes on Tuesday as Nakornluang Boxing Promotion keep 3 of their best fighters active in Pathum Thani. The first of the televised shows is on Thai Channel 3, in we believe it's the first Channel 3 show of the year so far. The headline bout sees former WBC Super Flyweight world champion Suriyan Sor Rungvisai (31-5-1, 13) defending his WBC Asian Boxing Council Bantamweight title for the 3rd time as he takes on limited Filipino challenger Fernando Ocon (12-5, 4). This really should be a mismatch in favour of Suriyan who is a real world class fighter, though with Ocon having never been stopped and having given Petch Sor Chitpattana a tough test a couple of years ago we do expect to see Suriyan at least forced to work for his victory. Suriyan isn't the only world level fighter on the card as stable mate and close friend Srisaket Sor Rungvisai (23-3-1, 21) fights in a stay busy fight against a yet to be named opponent. The idea seems to be that Srisaket, the current WBC Super Flyweight champion, will get a a very easy opponent to keep him prepared for an up coming contest with unbeaten Mexican Carlos Cuadras later in the year. One other bout we've had confirmed for the card is that of the unbeaten Nawaphon Por Chokchai (18-0, 13). Nawaphon, Suriyan's younger brother, will be taking on Filipino journeyman Rodel Tejares (20-27-5, 5) in what is really just a case of staying busy. Chokchai, who stopped Tejares in just 2 rounds last May, will be expected to take an easy and quick victory over the limited Filipino. After a couple of greats of action we knew we were going to feel disappointed on Sunday. Thankfully despite the fact there disappointment in terms of the fights we get on Sunday, we'll admit, we're glad to just be getting some fights as the Philippines gives us the only card of Sunday. The only action of the day comes courtesy of ALA Gym who has a small, low level card at the Gaisano Country Mall Parking Lot. 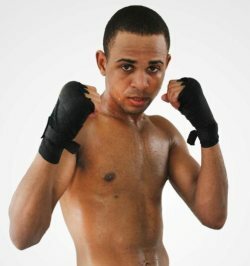 Typically it looks like a a very bottom tier though we'll admit we're genuinely interest in the main event as the talented and very promising Rolando Servania (5-0, 1) returns to the ring for his first bout the new year. The unbeaten Servania, the younger brother of the world ranked Genesis Servania, has began his career with victories over 6 unbeaten fighters. On paper that would be impressive though all 6 were complete novices with just 6 bouts between them. This Sunday sees the youngster taking a tiny step up as he fights the limited but experienced Dingdong Quinones (3-7-1, 1). Of course Servania will be favoured, big time, but this should serve as a chance to see whether or not the youngster has a killer instinct. If he does he may well take this mismatch and boost his own reputation something that we'd like to see. As well as Servania's bout with Quinones we're expecting 3 other bouts on the show. Unfortunately they are of a very low level with the most interesting man on the card being unbeaten Reymi Castellano Aleye (2-0, 1), pictured, who we believe was based in Cambodia of all places. We've read that he is now training at the ALA Gym and from his amateur background this young fighter is one to keep an eye. Aleye will be fighting Rodel Wenceslao (7-6-1, 2) and hopefully a victory here for Aleye will see him developing his career in the Philippines. The other two bouts don't jump out at us as being anything great but with 2 unbeaten interesting young fighters on the card it will something worth keeping an eye on for the results.